Some people can’t seem to break free from their past. They are haunted by choices; stuck on horrible, seemingly unforgivable things that happened. They dwell on their hurt and their pain and daily walk in circles around those events. They feel victimized, trapped, traumatized. They’ve been through hell and back, and moving on is never as easy as it sounds. I too have suffered. I remember days feeling I was stuck in a nightmare – lost, hopeless, devoid of life. I needed lots of help, from lots of people, to move through the patch I was in. I couldn’t have done it alone. 1) I did not need to stay a victim. 2) It was possible to accept what happened and work towards a happier, healthier future. Sometimes the simplest things speak the loudest, and this thought helped me to stop walking in circles and start taking ownership of my life. I find ‘acceptance’ is a daily practice. Accepting the things we cannot change – like the weather, the traffic, or the housework we’re responsible for – is one thing. But sifting through the larger crimes/ tragedies/ heartbreaks we go through is a process. Acceptance of what happened might only come after a long time, if at all. Acceptance doesn’t mean we forget it happened. Nor does it mean it won’t still affect us sometimes. But it does mean we’ve come to a point where it doesn’t control us anymore. The darkness starts to fade and we open up the window blinds, ready to begin a new future full of choices and freedoms we didn’t feel we had before. Next Where to take my dreams? 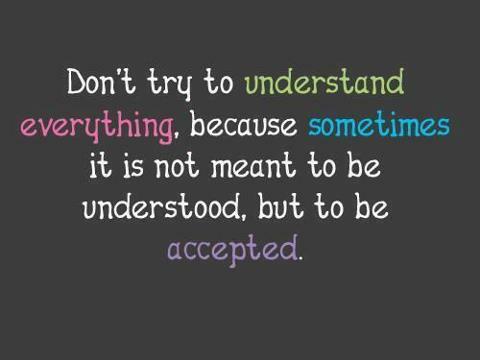 “Acceptance doesn’t mean we forget it happened. Nor does it mean it won’t still affect us sometimes. But it does mean we’ve come to a point where it doesn’t control us anymore.” This is so powerful. We can never erase the painful things that happen in our past (and we shouldn’t try to) with time God will help us recover, heal, and move on from it, but it IS up to us to decide whether or not we will allow it to control our futures or not. Great post! Thank you Anna! Yes. God will help us heal, but we must choose to engage in the process. There is always hope. This is a very hard lesson to learn. It is a choice. We choose to forgive. We choose to accept. We choose to move on. We choose to have joy. And, yes, sometimes it’s a daily choice. Thank you for this post. I’ve shared it with my friends, as I know this is a very timely subject. Have a wonderful week-end! Yes! Well said. It’s so important to remember we have a choice isn’t it? Thank you for sharing from your own personal experiences about dealing with the past. That always helps so much, because then you understand that it is not so easy just to “get over it.” I loved the hope of it not controlling us any more and beginning to see new choices and freedoms open up. :). God bless you, dear Ali! Thank you Debbie. Yes, getting over tragedy/abuse/trauma is never simple. Hope is powerful though and I’m so grateful for our ability to choose a different path. Only He can give us that strength. Bless you abundantly dear friend. The past can be haunting sometimes This reminds me of a line of a song “the devil in my head won’t let me forget” – I know I replay and torture myself with the pain of my shortcomings and failures. (This ties in well with a short story I wrote yesterday/early this morning – where the character is eventually consumed by guilt.) I appreciate you sharing your personal experience and your encouraging words! Yes! The pain and memories can claw at us can’t they… It sounds like a good story. We have to fight not to be consumed by guilt don’t we… So thankful we can find forgiveness and freedom in Jesus. I can relate to much of what you’ve shared here.